Natural gas offers huge opportunities for reducing the use of petroleum in transportation. One highly sustainable source of natural gas is biomethane, and that, by definition, is made from organic (usually waste) materials. The method by which biomethane is made is to first create biogas, using the anaerobic digestion process, and then remove the unwanted impurities (such as carbon dioxide), and the small trace amounts of compounds which would not be found in natural gas extracted from fossil fuel sources. That is done in a process known to the energy industry as “biogas upgrading” and there have been important innovations in the technology for doing this in recent years. Not least in the development of efficient membranes for this purpose. The potential impact that replacing gasoline (petrol) vehicles with natural gas (CNG) fuelled vehicles, can be appreciated when one considers medium and heavy-duty fleets. These have a significant potential for natural gas use, and they currently consume more than a third of the petroleum used for transportation in the U.S.
Natural gas is an excellent fuel for a wide range of heavy-duty transport vehicle applications, especially transit buses, refuse haulers, and Class 8 long-haul or delivery trucks. In addition, natural gas can be a very good choice at the moment for light-duty vehicle fleets which have the ability to use central refuelling. In other words, work out of a base, and can fill the tanks when then come home each night). The US Vehicle Technologies Office (VTO) has been supporting the development of natural gas engines and research into renewable natural gas production, for some time now. In fact, VTO has supported the development of natural gas engines for heavy-duty vehicles since 1992. We can go further than that to force this point home, as well, because nearly all heavy-duty natural gas engines on sale in the U.S. today can trace their origins to the US DOE's support for research and if not through research, through partnerships between the VTO and industry. Natural gas is known to be the cleanest burning and lowest carbon dioxide producing of the major fuels in use today. New methods of natural gas extraction such as fracking are increasing its availability, but not its sustainability. To increase the sustainability of natural gas, the US VTO has also been supporting research into the production of renewable natural gas. Renewable natural gas is a purified version of biomethane that results from the anaerobic digestion process which occurs without any encouragement in the decomposition of landfills, and is the product produced by wastewater treatment plants where the sludge is digested in in a “biogas digester” (or biogas plant), and also at livestock facilities where a biogas plant is in use. A Surprisingly Level of Reduction of Greenhouse Gas Emissions! Reducing vehicle emissions is also vital for human health, as many thousands of people die annually in our big cities, who otherwise would live on, due to vehicle fume particulate pollution. It also does this without the parasitic drag on performance produced by the pollution prevention devices which have to be fitted to petrol and diesel vehicles. Most people who read the above statistic will say that it is crazy not to use much more natural gas in place of petroleum and diesel, especially when the US has so much natural gas available now, and for the foreseeable future. So, What is Being Done to Raise Natural Gas Use for Vehicle Transport? The US VTO explains, on their website that through collaborating with industry and national laboratories, the VTO has done a great deal already. It has demonstrated the feasibility of purifying biomethane from landfills. As a result of this project the government identified more than 300 landfills which are currently producing biomethane. Furthermore, on average it was found that they could each produce up to 20,000 gallons of liquefied natural gas per day. The EPA is now assisting the waste management industry in promoting the installation of as many landfill gas extraction and biomethane production facilities, which have biomethane upgrading plant installed on landfills throughout the US, as possible. Since then, further research has identified more than 8,000 livestock units that could also support renewable natural gas production within economically viable anaerobic digestion plants. Although a number of agricultural/ dairy industry businesses were already installing their own biogas to biomethane production facilities, many more will soon be implementing this sustainable energy producing technology in accordance with the USDA “Roadmap for Renewable Energy” which aims for the creation of 11,000 new agricultural waste fed biogas plant installations by 2020. The result is that landfills and livestock facilities are using anaerobic digestion technology to produce fuel and to power renewable natural gas vehicle fleets, led by the refuse haulers, and milk haulers, but now also being followed by the first transit bus fleet operators. Having read this article we hope that our readers now appreciate the huge advantages of renewable natural gas as a transport fuel. It is number one for sustainability, but is followed by the substantial benefits of using natural gas from carbonaceous sources as a bigger part of the nation’s transport fuel consumption. This is especially true when compared with diesel fuel use, and the real public health damage being caused currently by urban air pollution from vehicle exhausts. 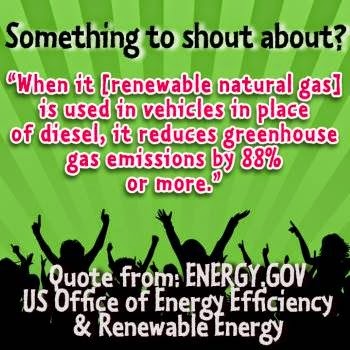 Finally, we do suggest to our readers that they go and visit the link above to the US government's article in which it states that "renewable natural gas reduces greenhouse gas emissions by 88% or more". Can it really be true? An 88% reduction! If it is, why isn't it a fact on everyone's lips? Surely, everyone that calls themselves "green" should be shouting about this from the rooftops! Your comments are appreciated.